please take back this hot, humid air mass. My supple Canadian body cannot tolerate this sticky 42 degree Celsius weather. Not cool. Literally. I have to play ultimate frisbee later today and I will definitely die. Let�s knock out one last blog before I croak. Impression time starts now. 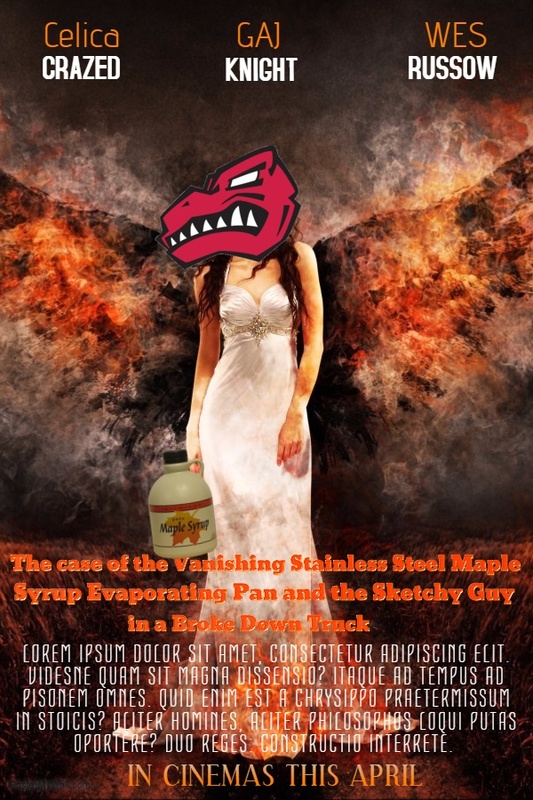 And I apologize in advanced for the image quality. My cellphone's camera was all I could find at the time. 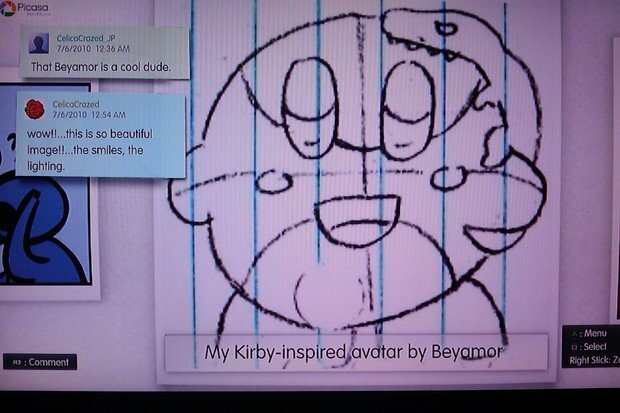 Impressions of an image viewer?? Really?? Sure why not. 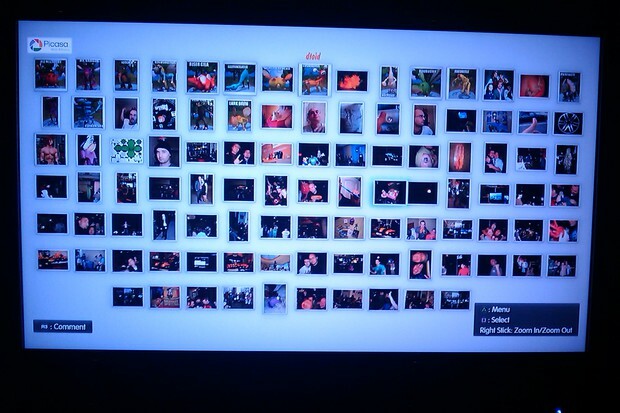 Originally there was no picture gallery on the PS3. 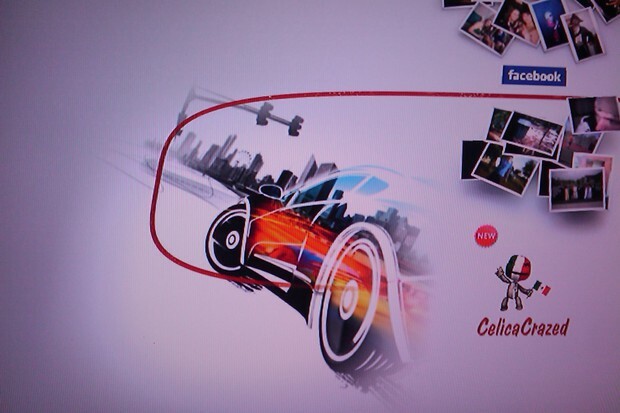 There was the photo column on the XMB which to me was more than adequate for viewing images. I mostly just have different backgrounds saved on my harddrive so I always found it functional enough. Apparently Sony did not. 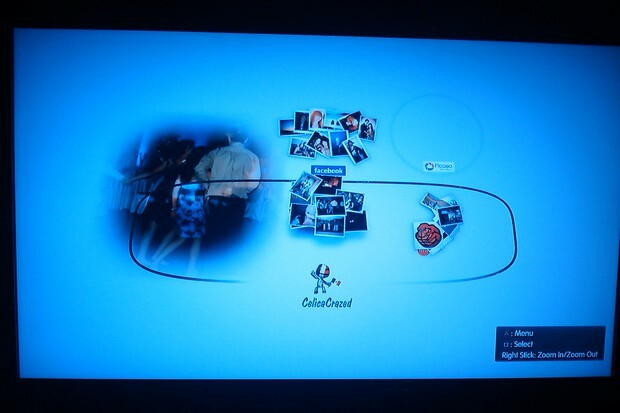 Trying to capture some of the Wii�s magic, since an image gallery was clearly the difference between the two consoles, they went about and created the Photo Gallery. It gave the user the ability to make fancy slideshows and that was literally it. For some reason though, Sony decided to keep putting resources into the Gallery and the results are something that actually impressed me. Seriously. 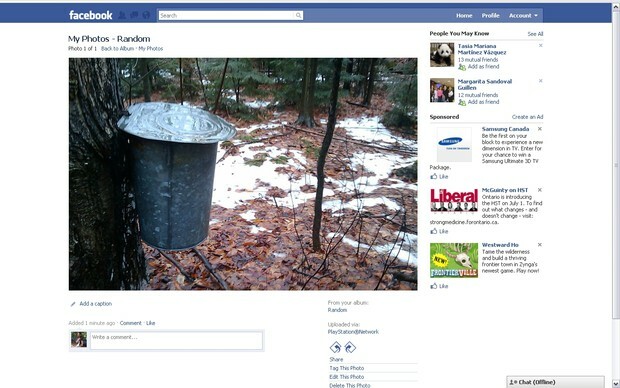 The recent update brought along Facebook and Picasa integration. Of course this update is practically meaningless if you do not have an account for either of the two but it will be cool for those that do. Ok maybe not cool but convenient nonetheless. That�s the word I�m looking for. 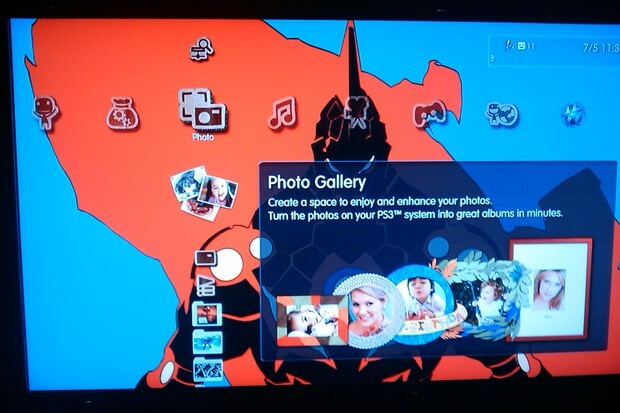 There are three tabs to the Photo Gallery: your images saved to your PS3 (left tab), your slideshow playlists (middle tab) and your PSN photos (right tab). 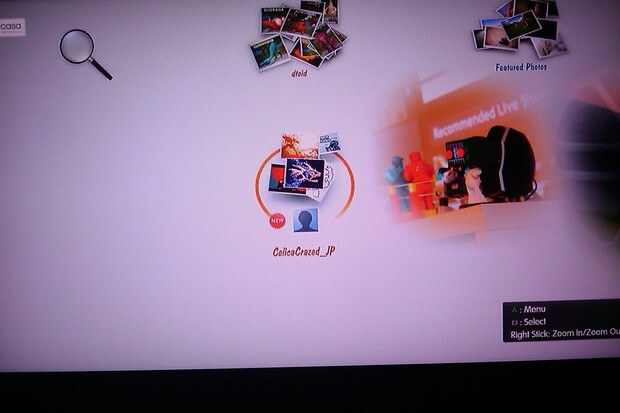 The image above is from the PSN tab. After logging into your Facebook and Picasa accounts, icons appear showing your photo albums. The pile of photos directly above my PSN avatar are my Facebook photo albums; above the Facebook icon are the photo albums of my friends. The problem with looking at your friends� Facebook photos on here is that they will come up in any order your PS3 chooses. I have 91 friends. It is annoying at worst for me. For people that have 300, 400, over 1000 friends....well you will be swimming through a lot of names. There is no search engine either so you better be hoping your internet is speedy. A nice touch though is the �new� icon which notifies you who recently added photos. 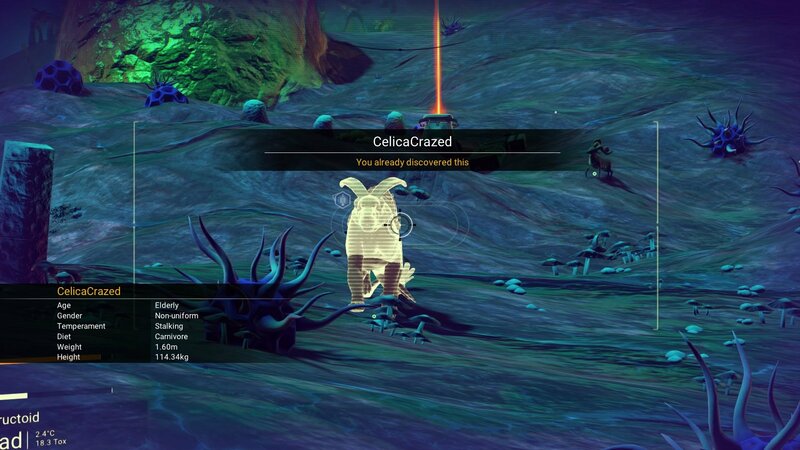 As for image quality, the Photo Gallery works amazingly well. 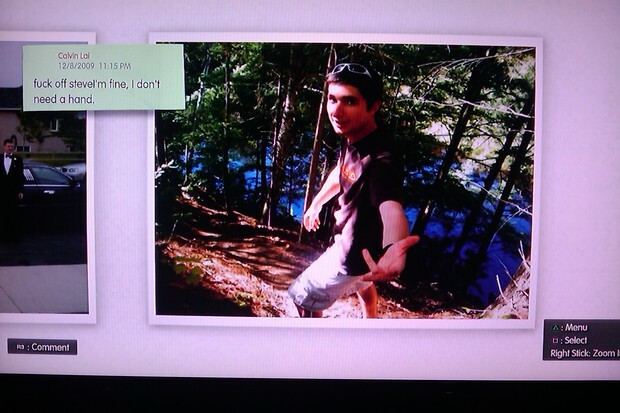 That�s right, the PS3 with all its Cell Processors and Blu-Rays displays still pictures really well on my HDTV. No stretching or blurring and whatnot. Does what it�s supposed to do. And yes, that is me. 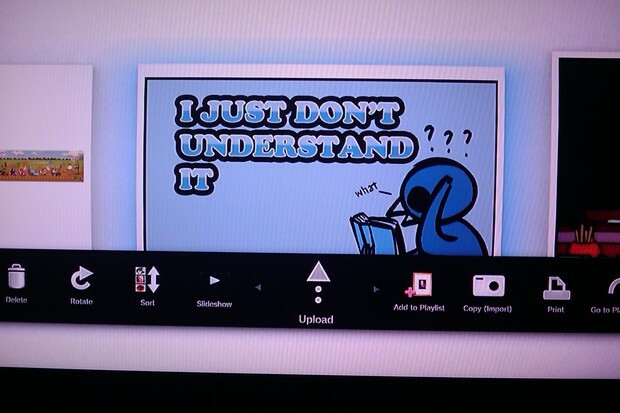 On the PSN tab, your Picasa web albums are found under the lower of the two icons. It took me awhile to figure out that the top icon was for your Picasa friends. Since I do not have Picasa friends, I used one of my alt accounts to friend myself. I know, lame. What is interesting about this page though is that there is a �Featured Photo� icon and a search icon. The featured photos are those chosen by the Picasa development team. Essentially, they are �promoted� pictures. They�re your typical artsy-fartsy type of photos though they do look pretty. The search icon on the other hand lets you search shared photos on the Picasa network. I decided to see what �dtoid� would pop up. A little disappointing is that you can only have one search topic at a time. Looking up something else will get rid of your last item. ZOMG!! I found Hamza and Samit!! Garison is lurking in the background too!! I feel like such an internet lurker now. I was going to leave a comment but I couldn�t find a way to see whose photo it was. Even worse is the fact that the only way you can add Picasa friends is through the website. I couldn�t do it on my PS3. Bummer. The thing I�m probably most disappointed with the Photo Gallery is that Sony was saying that you could share photos with your PSN friends, which of course turned out more cumbersome than it needed to be. To let your PSN friends view your photos, you must select an album and manually share it. A PSN message will pop up allowing you to select who you want to send it to. The album will appear at the bottom of the PSN tab. I�m not sure if it specifies which photos were from whom but with only one person, there is no name to differentiate. I�m not sure what happens when multiple people send you albums, if it just goes by album name or what. If you have multiple albums you want to share you must send them out individually. Something that gives me hope is the empty space to the left of the Facebook icons. The PSN tab was clearly made three icons wide but only two columns are being used. I�m assuming/hoping that sharing among PSN friends is the next logical step. Right now the easiest way to share with everyone is to become Picasa friends and that is just annoying to do. Also spamming your friends list with albums probably isn�t much better. Commenting on photos is pretty easy. Just hit R3 and type away. Though watch what you say because only the owner of the photo can delete comments. 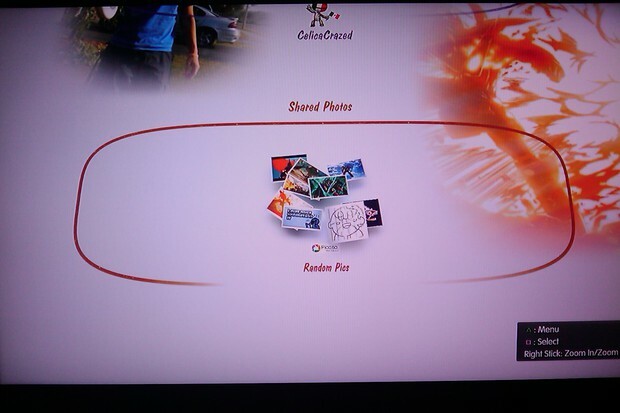 Now that I remember, you can�t save Facebook or Picasa pics to your PS3, nor turn them into wallpapers. Kind of a letdown though I�m sure that is more because of privacy issues or something. Also you need a Picasa account to comment on Picasa pics and a Facebook account to comment on Facebook pics. Otherwise you sit there typing a well thought out comment only for it to vanish into nothingness. Yeah, it�s why I made the alt account to begin with. 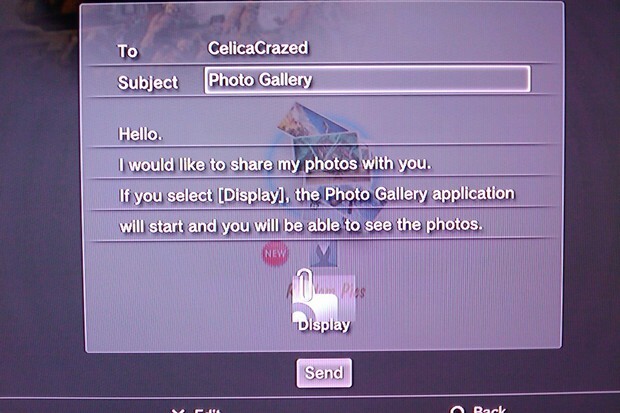 Since I haven�t mentioned it yet, you can upload photos from your PS3 to both your Picasa and Facebook accounts. It works likes you�d expect, which means great. You even get the added �nerd cred� on Facebook as it states that it was �uploaded via PlayStation Network�. Sweet. So is the new Photo Gallery worth your time?? If you have either Facebook or Picasa, or both, then definitely. It�s not something that you�ll be loading up every night but it does give you a different way to lurk and share photos. It is much easier to crowd around the tv then the computer if you want to show off pics from your latest trip with house guests. While I have a few complaints, it doesn�t seem like Sony will be stopping here. Anyways, it�s free. WHAT MORE DO YOU PEOPLE WANT!?!? Yes, I�m talking about more Facebook. Deal with it. Along with the firmware update and Photo Gallery update, Sony also finally released an app on Facebook to post your PSN ID. It�s pretty bare bones though. It contains your PSN name, your trophy count and level, and the list of games you have earned trophies in. For some reason, you cannot actually see trophies for specific games. You just get the overview. I thought it was supposed to show the PSN ID of my Facebook friends, though it could be because none of my friends have it to begin with. Oh well. Not really much more to say. Is it worth a download?? No probably not. It has little functionality other than stating your name. 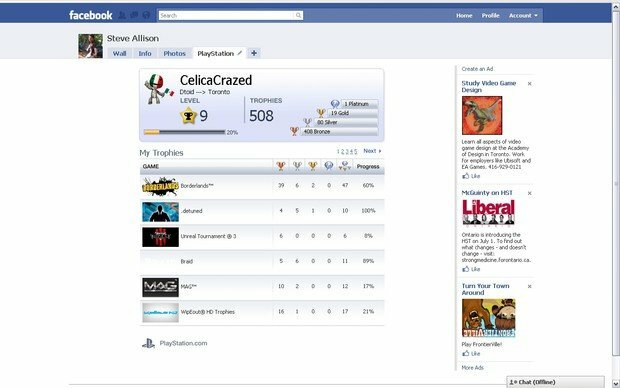 If you like me have been wanting a way to put your PSN ID on your Facebook page though, then you probably already have this. If not, it�s your call. 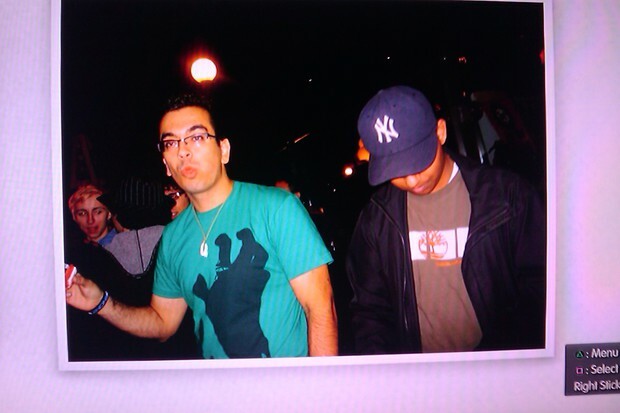 Also, this is the first Facebook application I�ve ever downloaded. I held out for so long but couldn�t resist. Also, also, I was planning on including my Medal of Honor beta impressions here but it was making this blog way too long. Since you are never supposed to serve the main course first, nor dessert, I�ll post it in a day or two. Hope you still have an appetite then. And I made it through an entire blog without mentioning PlayStation Home once.....oh DAMMIT! !